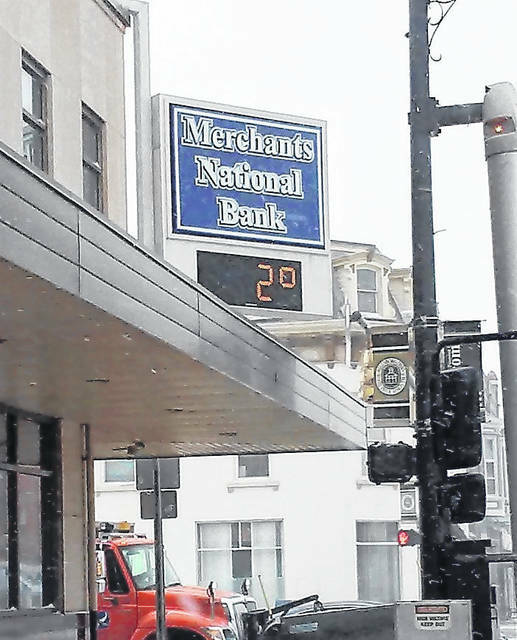 The thermometer at Merchants National Bank in Hillsboro Wednesday morning read just 2 degrees Fahrenheit as an arctic blast put Highland County in the deep freeze. A deadly deep freeze enveloping the Midwest sent temperatures plunging Wednesday to rival some of the most frigid spots in the world, according to the Associated Press, and local forecasters predicted more of the same for Thursday in Highland County — as well as significant warming over the weekend and into next week. As of Wednesday afternoon, the National Weather Service forecast for Thursday showed a high of 15 degrees with wind chill values as low as minus 21 degrees during the day and snow likely in the early hours of Friday morning. But NWS forecasters said the weather will likely break over the weekend, with temperatures climbing through the 30s Friday and Saturday to reach a high near 55 degrees Sunday and 59 degrees Monday. High temperatures at the beginning of the week will be accompanied by rain showers, according to the NWS. On Wednesday, one of the coldest days in recent memory, temperatures remained in single digits throughout the day. Combined with 30 mph wind gusts, low temps gave the area wind chill readings of minus 15 to minus 30 degrees Fahrenheit, leading Highland County Sheriff Donnie Barrera to declare a Level One snow emergency. As previously reported, Level One is a basic snow alert declaration stating that while no roads are closed, unnecessary travel is discouraged, but if deemed necessary extreme caution is urged. The bitter cold was the result of a split in the polar vortex that allowed frigid temperatures to drop much farther south than normal. That meant temperatures in parts of the Midwest were lower Wednesday than in Antarctica, where the Amundsen-Scott South Pole Station hit negative 25 degrees — balmy compared to Fargo, North Dakota’s negative 31 degrees and Minneapolis’ negative 27 degrees, according to the National Weather Service. The Associated Press contributed to this report. Reach David Wright at 937-402-2570.